The pizza the I got was a frozen cheese and tomato pizza which was wheat and gluten free. It looked...well...like a cheese and tomato pizza! I won't bore you with the details of everything I did next but I basically threw on some toppings and extra cheese then cooked it (from frozen) following the directions on the packet. I've never tried any wheat of gluten free breads before so didn't really have anything to compare this to but have to be completely honest - I didn't notice any difference between this and pizzas that do have gluten or wheat. The base was crisps around the edges and soft in the middle - perfect! I can't think of anything better to accompany pizza than garlic bread and not just any garlic bread - parmesan garlic bread! Roast 3 cloves of garlic in their skins for about 10 minutes (until they soften), allow to cool and remove from their skins. Using a fork, mash up the garlic until it's a smooth paste. Roasting the garlic mellows out the flavour a little but if you like a more sharp garlic taste, skip the roasting! Mix the garlic into the butter thoroughly then mix in the parmesan and allow to rest for about half an hour - this lets all of the garlicky goodness combine with the butter. Slice into the baguette but make sure you don't slice all the way through - leave about half a centimetre at the bottom. I like big fat wedges of garlic bread so I cut slices about and inch and a bit thick. Spread the garlic butter in each slice of the baguette and then sprinkle some extra parmesan on top. 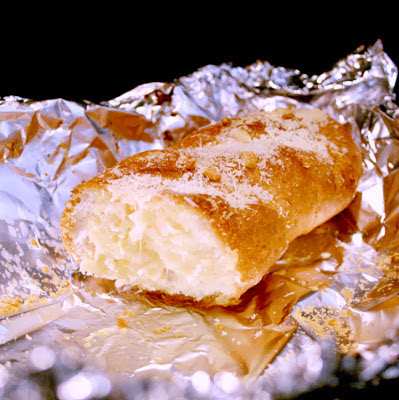 ... bake for 15 minutes then open the foil and bake for a further 5 minutes or until the cheese is golden brown on top.